23rd September 2009: This page was originlly on http://www.BuyVintage.co.uk but i’ve parked it here to archive it so I can add my new DKW RT175 to the BuyVintage page. 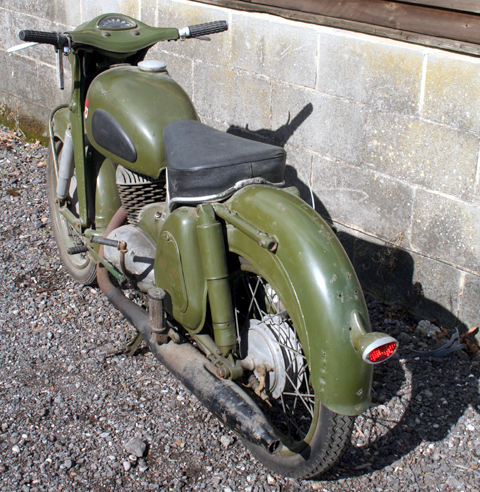 I bought this 1956 DKW because I previously restored a 1959 model that I enjoyed riding, and I suppose I developed a bit of a DKW addiction. I don’t like riding shiny bikes, nor the same sort as everyone else. This one is delightfully different – and you’re certainly unlikely to bump into another at any show, road run or rally. 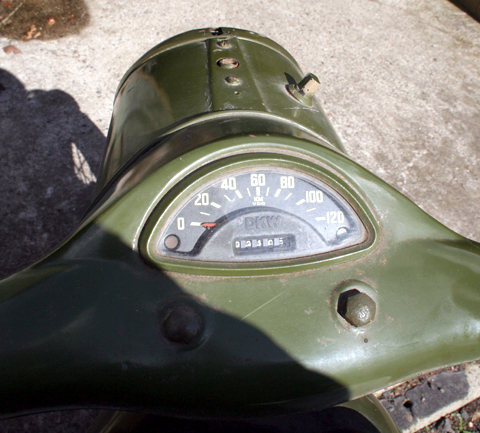 This 1956 RT 175 ‘deek’ had been in storage for 25 years, and has no documentation with it. It’s in very sound condition and did not take long to bring back to life. It has a daylight MOT (to economize so I could sell it for less money, we did not do the lights). Quite a heavy bike for a 175, much bulkier than a 175 Bantam for example, but lighter than a C15. 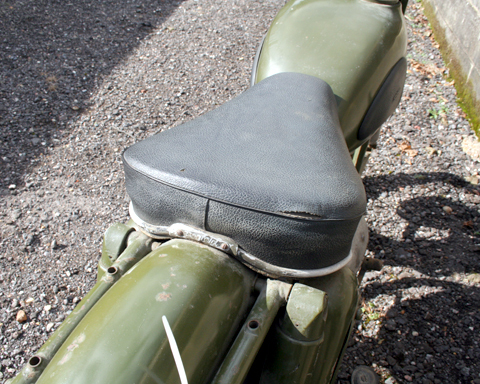 It has rear footpegs if you want to fit a pillion. To start, turn the ignition push-key 90 degrees, turn on petrol, advance choke fully. (Choke is hidden next to left-hand handlebar grip). Turn off choke once it fires. 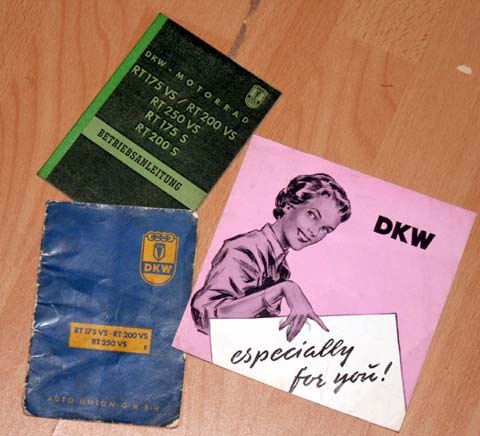 Many DKW parts were used in later MZ motorcycles (as well as other marques), so it’s not hard to obtain replacement spares should you ever need any. With its sturdy build, excellent design – and DKW’s top reputation for two-stroke manufacture – it’s a practical 53-year-old motorcycle to own and use. 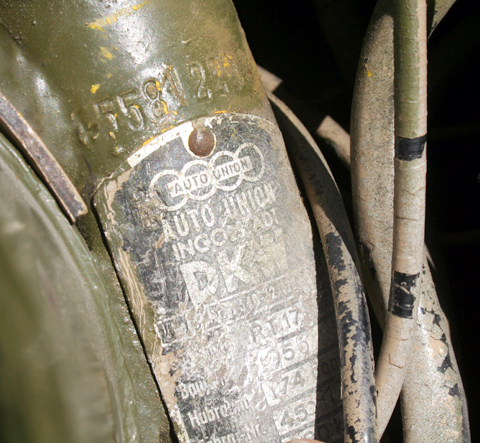 * UPDATE 19/12/08 – MY MECHANIC HAS NOW WORKED HIS MAGIC ON IT, AND IT STARTS EASILY, RUNS WELL, AND HAS NOW BEEN MOT’D. 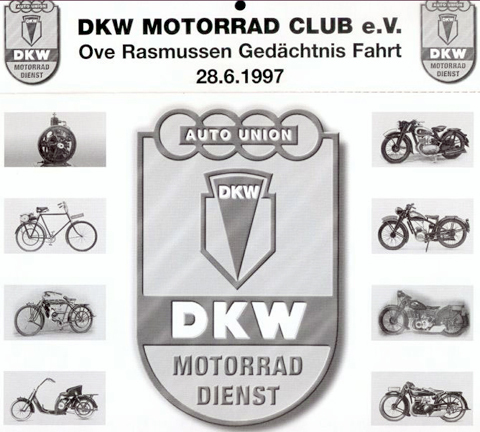 J. S. Rasmussen founded Motorenwerke Rasmussen in Zschopau, Germany in 1906, and entered the motorcycle manufacture with a bicycle motor in 1921. 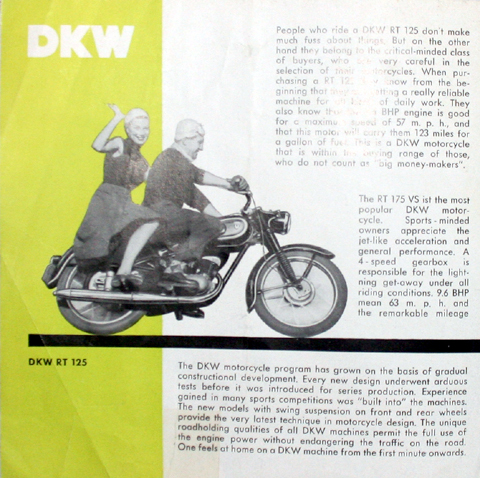 The name DKW was trademarked in 1922 and the firm went on to become one of the largest manufacturers of motorcycles in the world. By 1928 they were building some 65,000 engine units annually, and DKW engines could be found powering some 60 German marques of the interwar period. 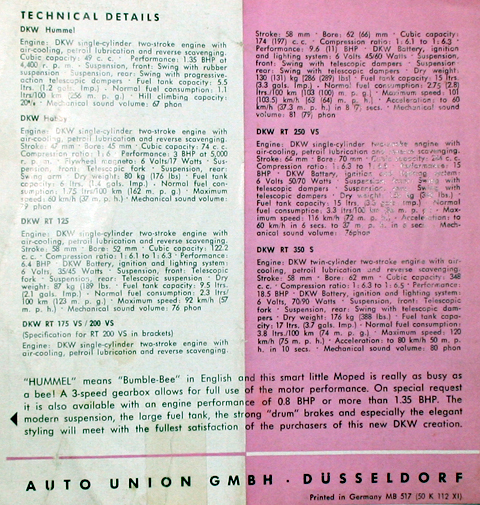 They joined Audi, Wanderer and Horch to form Auto Union in the 1930s, merging again in the 1950s with Victoria and Express to form Zweirad-Union, which in turn was absorbed by Sachs in 1965. 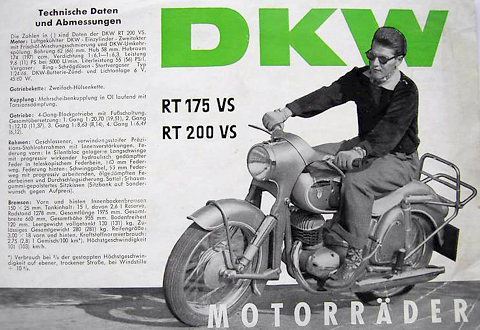 DKW motorcycles used 2-stroke engines which were technically advanced; the best-known one in the UK is the RT 125. 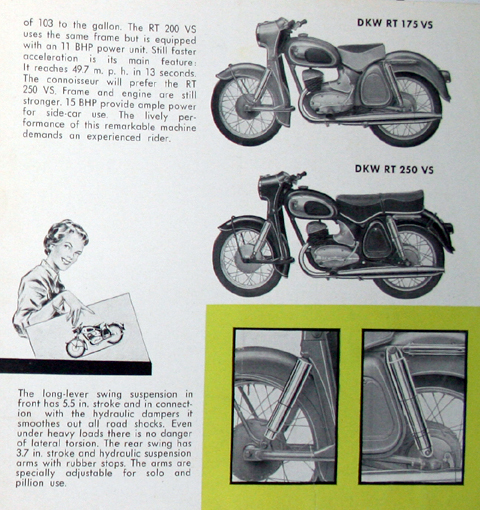 As reparations after World War II, the design drawings of the RT125 were given to Harley-Davidson in the US and BSA in the UK. 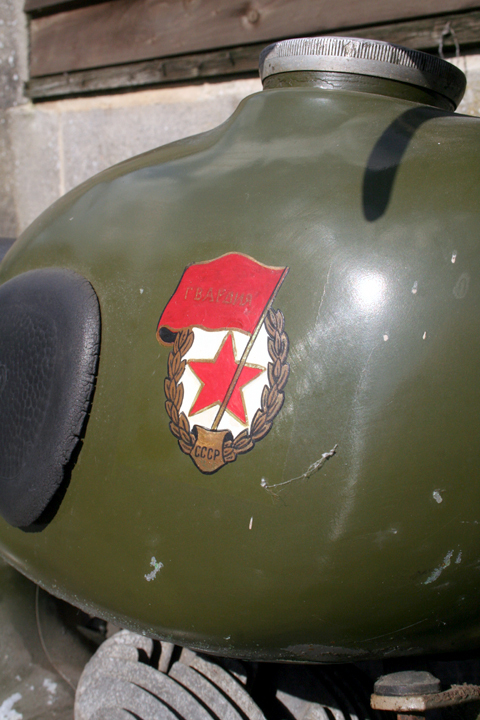 The HD version was known as the Hummer, while BSA used them for the Bantam. 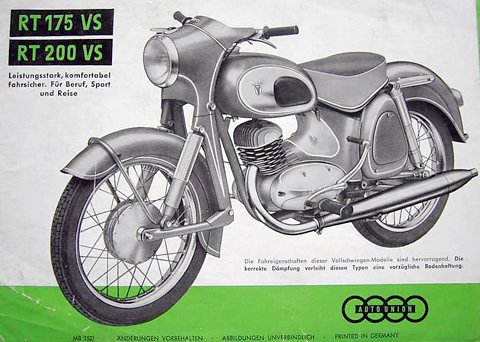 Designs from the DKW 2-stroke engine was also used in the Ariel Arrow and Leader. IFA and later MZ models continued in production until the 1990s, when economics finally brought production of the two stroke to an end. 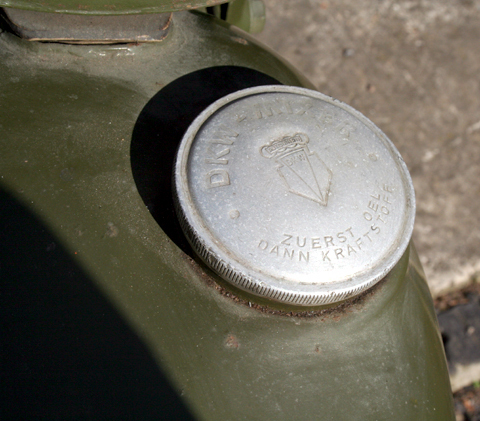 Other manufacturers also copied the DKW design, officially or otherwise, including Yamaha, Voskhod and Polish WSK. 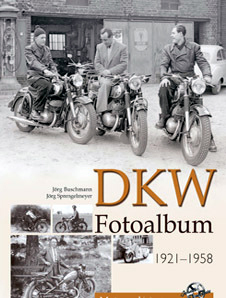 Vintage DKW motorcycles enjoy an excellent reputation for design and engineering and are sought-after machines today. Spares are obtainable from Germany (some components were used in later MZ motorcycles, which makes spares availability much easier). There’s an active club in Germany, and Bernie of the British Two-Stroke Club runs an enthusiastic section for German machines in the UK. All the images you see here are digital. However, I do own photocopies of the two handbooks and brochure in the photo below.